We followed this banded sea snake (Laticauda colubrina) for several minutes at Racha Yai before it surfaced to breathe. Sea snakes are said to be the most poisonous creatures on the planet, but they are not aggressive and their mouths are tiny. 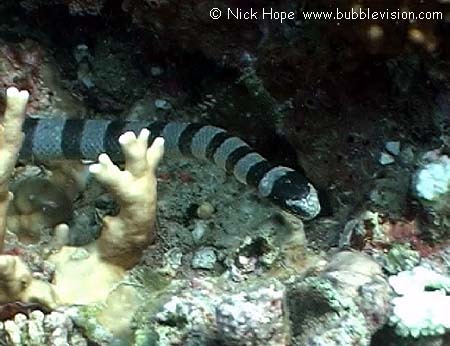 Our DVD features this banded sea snake and other video from Racha Yai.